Home EDUCATION EMPOWERMENT Residents join hands under AJIBIKA AFRICA for schools facelift to revive decade-old institutions’ past glory. Residents join hands under AJIBIKA AFRICA for schools facelift to revive decade-old institutions’ past glory. 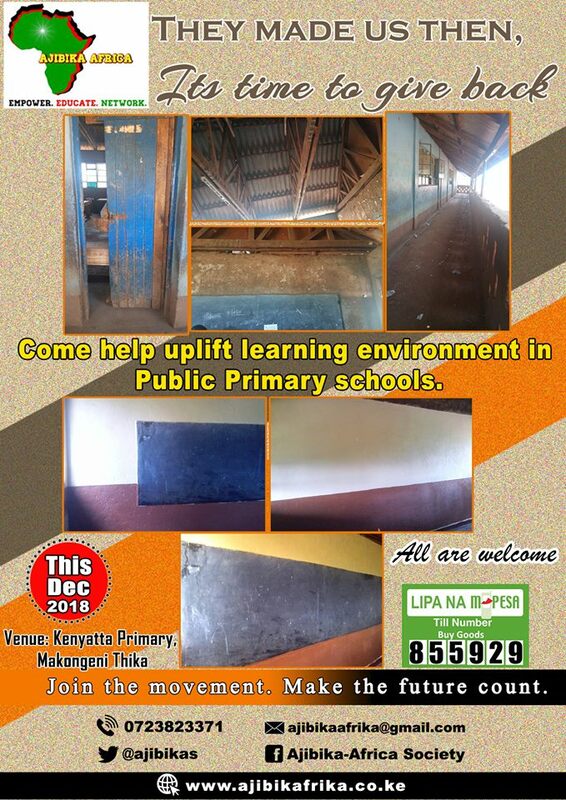 A group of Thika residents have come together to renovate the aging and dilapidating public primary schools in the spirit of private-public partnerships and as a way to give back to the society. Under the coordination of ‘AJIBIKA AFRICA SOCIETY’, the residents say that they feel ashamed that the institution they acquired their education from have been neglected for decades and they had decided to take the onus of reviving the institutions’ infrastructure to facilitate a congenial atmosphere for the learners in a programme dubbed “Back To Our Roots”. “It’s quite shameful that our public schools are in such a deplorable condition. Our parents and generations before us took the initiative of building them from the scratch since they knew the value of education but majority of them were let to crumble as everyone looked at the government to build and maintain their infrastructure,” explained Juma Hemedi, the group’s Coordinator during the launch of the programme at Kenyatta primary school, Makongeni Thika. Juma said that they had heeded to the clarion call by area MP Eng. Patrick Wainaina to well-wishers to adopt schools so that they could improve the institutions’ infrastructure for the benefit of the learners. “The government cannot do this alone because as we all know, there is scarcity of finances. But if everyone took the responsibility to make these institutions more habitable and learner-friendly, the ultimate result will be of benefit to all of us as a community,” he noted. Their first project as AJIBIKA AFRICA SOCIETY will be to renovate two classrooms at the school as a model project to encourage others to chip in and assist the area MP in making all the public primary schools regain their lost glory of the heydays and be in a position to compete with the private academies both in terms of infrastructure and in quality education. Speaking separately, MP Wainaina said that his office would support the organisation in its endeavour to make public learning institutions learner-friendly, and called on local companies, businesses and individuals to follow suit. “We are going to renovate two more classrooms at Kenyatta Primary School adjacent to those done by AJIBIKA using the standards set by the group. We are requesting more people to join on board so that all our learning institutions can accord a congenial atmosphere to the learners,” said Wainaina. Ajibika is a Swahili word that means “responsible or accountable”. The group was registered in February 2015 with the aim of creating an independent forum for citizen participation and the need to encourage communities to be pro-active rather than reactive to the challenges facing the country, both at the national and county level. It takes pride in its vast network of members and volunteers who have been instrumental in helping realise its programmes and objectives.